Henry moved his Court to Winchester in early September in preparation for the upcoming birth. Not long after they arrived Elizabeth went into labour and gave birth to Arthur a month early. Despite being premature Arthur was a healthy baby. Elizabeth was not as fortunate and suffered with a fever soon after the birth but thankfully made a full recovery. Arthur’s birth was celebrated with bonfires in the street and choristers singing Te Deum at Winchester Cathedral. A magnificent christening at Winchester Cathedral was already being planned but now had to be brought forward by a month. The date was set for the 24th September which would give one of Arthur’s intended godfathers, John de Vere, 13th Earl of Oxford, time to travel to Winchester for the ceremony. Arthur’s other godfathers were Lord Maltravers and Thomas Stanley, 1st Earl of Derby. His maternal grandmother, Elizabeth Woodville, acted as his godmother and also carried him during the ceremony. It was not long after Arthur’s birth before he was being used as a political pawn by his father. Eager to strengthen his kingdom against the might of France he sought an alliance with Isabella of Castile and Ferdinand II of Aragon. When Arthur was only 2 years old he was betrothed to Isabella and Ferdinand’s youngest daughter, Catherine of Aragon, as part of the Treaty of Medina del Campo. More accolades would soon follow for the young prince. On 29th November 1493, when Arthur was still only 3 years old, he was made a Knight of the Bath and on the 30th November he was created the Prince of Wales. This all coincided with the birth and christening of his sister, Margaret Tudor, who was named after her godmother and paternal grandmother, Margaret Beaufort. 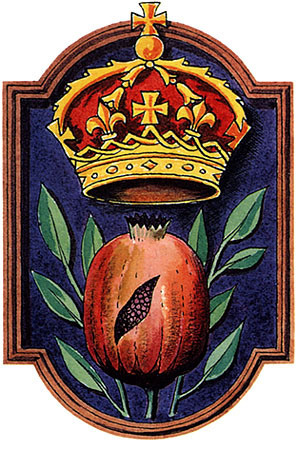 Things seemed to be going well for Henry VII and his new dynasty was flourishing. 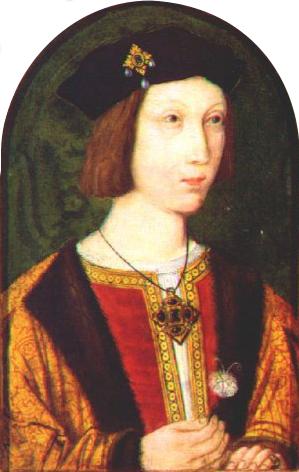 Elizabeth would go on to have another son, the future Henry VIII, in 1491 followed by a daughter, Mary Tudor, in 1496 and there were high hopes placed on the shoulders of the young Prince Arthur. Sadly things would not turn out quite as expected. Arthur finally married Catherine in 1501 after much toing and froing from her parents who wanted to ensure they were making the best possible marriage alliance for their daughter. The turning point came when the pretender Perkin Warbeck was executed as this helped ease Isabella and Ferdinand’s fears on the stability of Henry’s rule. After their marriage Arthur and Catherine moved to Ludlow Castle which is where Arthur resided as Prince of Wales and where it was hoped they would gain experience of government by looking after the Welsh Marches. 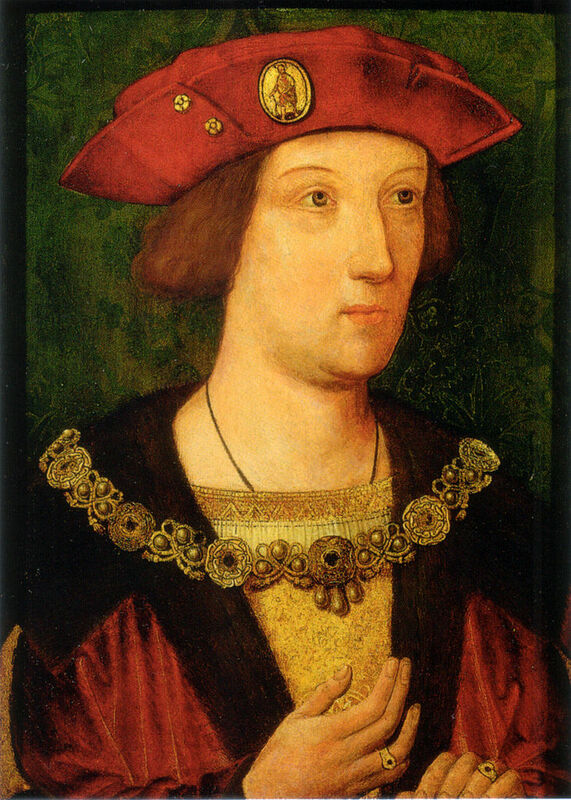 Sadly Arthur fell ill shortly after they arrived back in Wales and died suddenly on 2nd April 1502 aged only 15. It is not known exactly what killed him but it may have been tuberculosis, also known as consumption, or the dreaded sweating sickness. Catherine also became ill and missed Arthur’s funeral at Worcester Cathedral as did Henry VII although this may have been because he was scared of catching the plague. Arthur’s untimely death meant he would never go on to reign over a Golden Age of England as Henry VII had envisaged and it changed the course of history immeasurably. It would be Arthur’s younger brother who would succeed their father to the throne becoming the infamous Henry VIII who, for many, epitomises everything about the Tudor era. It would also be Henry VIII’s second daughter, Elizabeth I, who would go down in history as ruling a Golden Age of England. This entry was posted in Catherine of Aragon, Henry VII, Tudor Events and tagged Arthur, Catherine of Aragon, Henry VII, Prince of Wales, Tudor Events by admin. Bookmark the permalink.